DigiCMB: Final Project Report for HealthInfo Island Project in Second Life Now Available! Final Project Report for HealthInfo Island Project in Second Life Now Available! A final project report from the Alliance Library System marks the latest chapter in an exciting experiment funded by the Greater Midwest Region of the National Library of Medicine (GMR/NNLM). The report is available here. 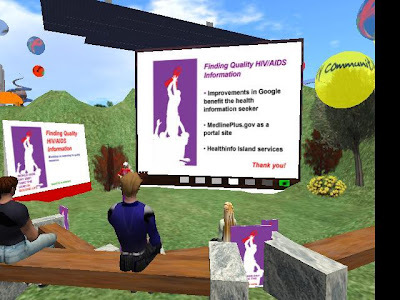 The project, entitled “Providing Consumer Health Outreach and Library Programs to Virtual World Residents in Second Life” provided outreach to virtual medical communities, health training and information for residents of Second Life, links to consumer health resources, one-on-one support to residents, and part-time staffing for HealthInfo Island. 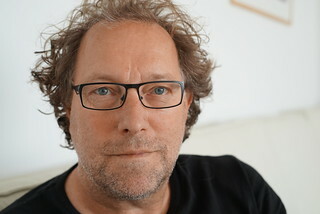 Working with Perryman on the project was Guus van den Brekel, Coordinator of Electronic Services, Central Medical Library, University Medical Center, Groningen. Tom Peters, CEO of TAP Information Services, evaluated the project and authored the final report. On HealthInfo Island, the first version of World AIDS day was observed, along with a class on finding quality AIDS and HIV information, a series of presentations by health educators and support group leaders whose “real life” locations were all over the world. A “Path of Support” created by a member of the disability community called the Heron Sanctuary, displays some of the more than 70 health support groups active in Second Life. Other events included a panel discussion about design for accessibility, a presentation about grassroots activism for disability activitists, and a casual question-and –answer session with a diabetes support group and an internal medicine physician in Greece. ‼ I love this blog, again. KOPERNIO extension to find PDF's : plus Open Access button, Unpaywall, Google Scholar and Connect UPDATED! BrowZine™ @ UMCG / Univ Gron NOW in LICENSE for you! A browsable newsstand of the library's top journals. 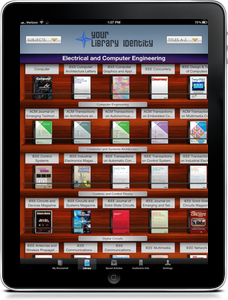 Easily find, read, and monitor thousands of scholarly journals directly from your iPad.